Are you interested in finding out more about Casanova, the serial seducer and feminist who once famously said: I have never made love to a woman whose language I don’t speak because I like to enjoy myself in all my senses at once. 3. A twenty-five minute Q&A with Susan and your book club through Skype. 4. 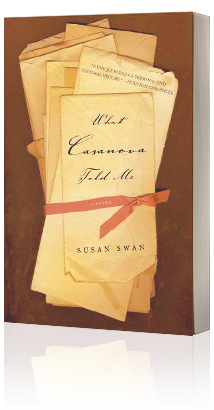 Other features such as the song What Casanova Told Me inspired by the novel and written by Albertan folk singer Corie Brewster are available under multimedia on Susan’s blog. If your club makes What Casanova Told Me your Valentine, you will receive a free signed copy for a book club raffle of The Biggest Modern Woman of the World, as well as a DVD of the What Casanova Told Me Bookshort, a short film inspired by the novel.